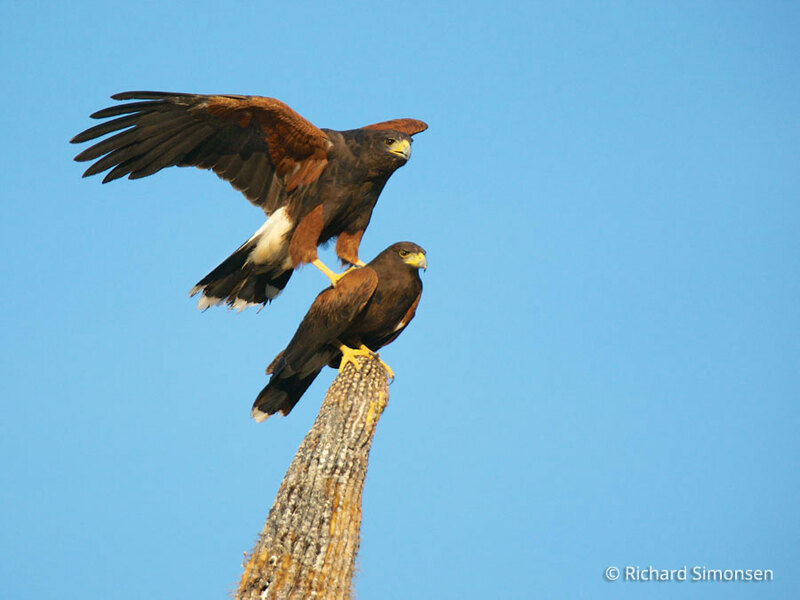 Harris’s Hawks are social birds. Some of the young birds will stay with the family unit for up to 3 years and help raise subsequent broods. Harris's Hawks are popular in the sport of falconry because of their group hunting style. Harris's Hawks engage in a unique behavior called "back stacking" where they will stand on top of each other when perching spots are scarce! 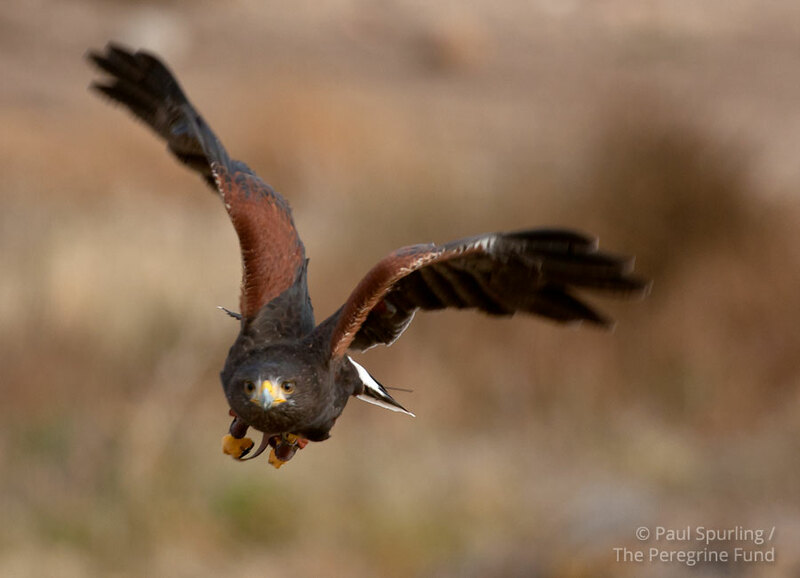 Though The Peregrine Fund doesn't work directly with Harris's Hawks, our efforts in scientific research, habitat conservation, education, and community development help conserve raptors around the world. We also supply literature to researchers from our avian research library, which helps scientists the world over gather and share important information on raptor conservation. 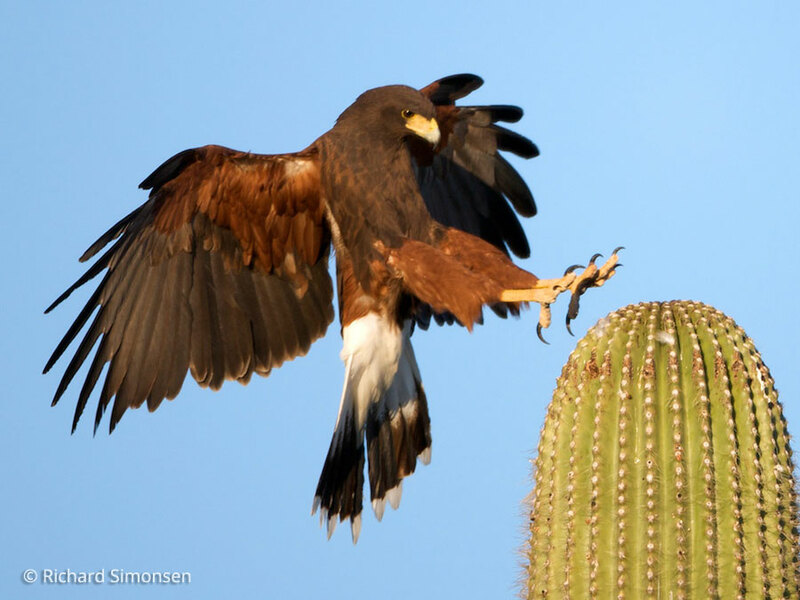 The Harris's Hawk is found throughout much of the Americas. Its northern limit is the southwestern United States, including portions of Arizona, New Mexico, and Kansas and south-central Texas. The species' range continues south from there into Mexico, through Central America, and into parts of South America. 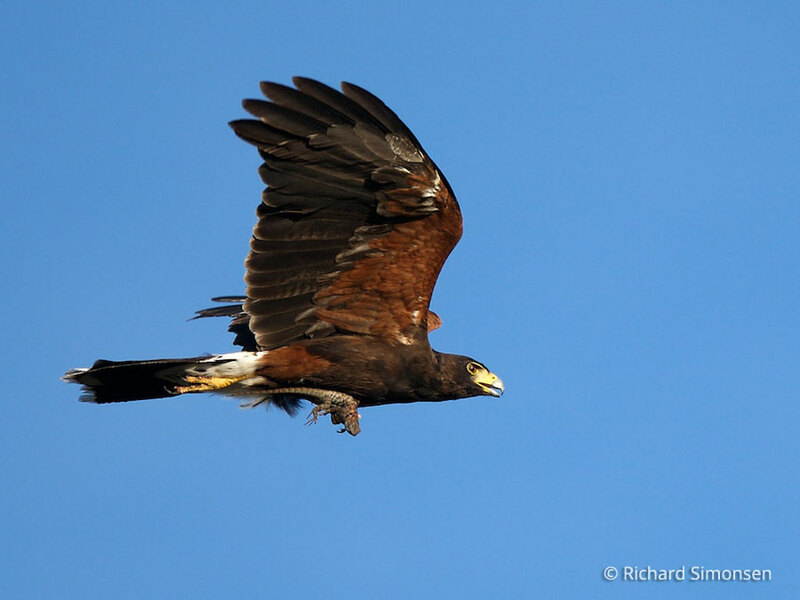 Despite its presence in some countries that have large tracts of tropical forest, the Harris's Hawk is generally not a tropical forest species. Instead, it prefers desert, arid scrub and savanna, agricultural lands, and even marshy open country with scattered trees and patches of woodlands. Its desert home in Arizona is dominated by saguaro cactus and palo verde and mesquite trees. 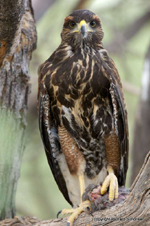 This hawk is generally found in lowlands and middle elevation habitats. 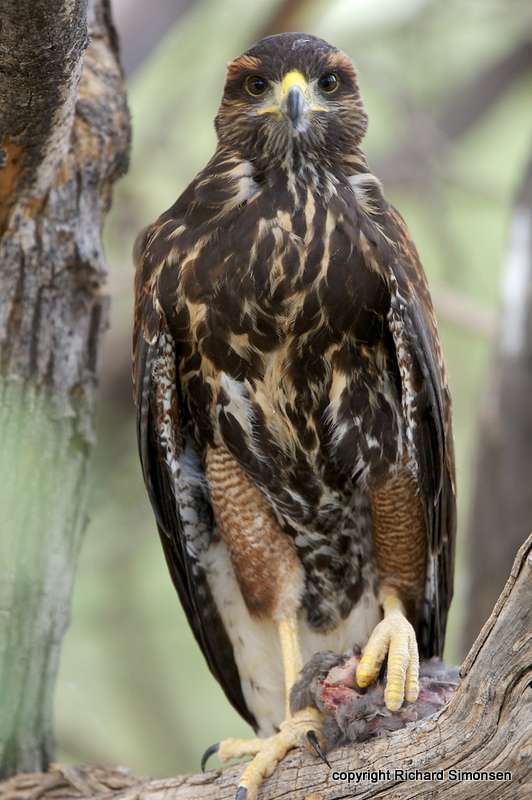 Formerly known as the "Bay-winged Hawk," "Dusky Hawk," and "One-banded Buzzard," the Harris's Hawk is a stunning raptor with a dark chestnut back and chest that contrast with its bright rusty-colored thighs and wing patches. It has a broad, wide stripe at the base of its tail. Almost unmistakable, it can be seen perching low in trees, shrubs, or at times even on the ground. This diurnal, non-migratory raptor also can be seen soaring quite often. Its broad wings and tail make it ideally adapted to soaring over the desert skies of its home. Unlike most raptor species, the Harris's Hawk is an extremely social bird and though it can be seen by itself or with another hawk, it often hangs out in small family groups. As a family should, they hunt together, help keep watch for predators together (and signal an alarm call if one is seen), and even work together to help raise young. Some biologists think that individuals use their tails, specifically the bright white band in their tail, as a way of communicating with other Harris's Hawks. When hunting, or perching, they may move their tail from side to side or spread or close their tail feathers, sending silent messages to the rest of the group. Harris's Hawks are "back stackers." If you have ever seen a cheerleading stunt called the "pyramid," you will get the idea. Well, sort of. Unique only to Harris's Hawks, the maneuver sounds exactly like what it is – they sometimes stand on each other's backs. Why? Because it's handy when there aren't many places for the birds to perch. Sometimes as many as three or four birds will be stacked neatly, one on top of the other, taking in the scenery! Those individuals that live in the desert often use cacti as a perching spot, despite the cacti's spiky surface. Some biologists believe that the bird's thick-skinned legs make it possible for it to perch among all those thorns, and its long legs help keep the rest of its body far away from any sharp parts of the plant. 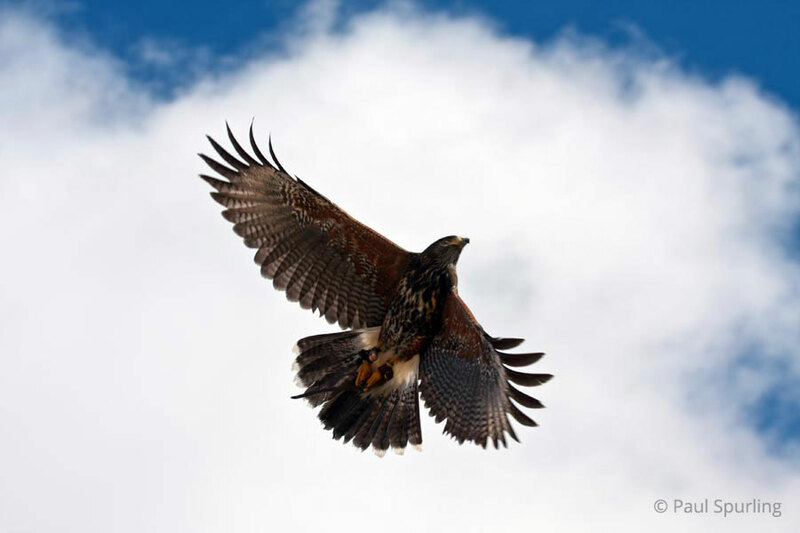 The Harris's Hawk isn't threatened by too many natural predators. They may fall prey to Great-horned Owls or the occasional coyote, and ravens may try to steal eggs or young from nests. But because they live in family groups, they have many eyes looking out for predators, which helps everyone stay safe. However, there are still many human threats that these hawks have a hard time avoiding, no matter how many are keeping watch. Harris's Hawks prefer to live in open country, and there is some evidence to suggest that they are moving into habitats that have become open due to deforestation. Even so, this is happening at the same time that their native habitats are being lost to development. The Harris's Hawk also faces many other threats that other birds of prey face, including poisoning, collisions with vehicles, and electrocution on power lines. These beautiful birds, sadly, are occasionally shot and killed by humans as well. Harris's Hawk family members help each other watch for predators and even use each other as perches, but the family cooperation doesn't stop there. Harris's Hawks often hunt in family groups as well. Though individual birds hunt by themselves, especially when chasing smaller prey, the family must hunt together if it wants to take down larger game, such as jackrabbits. To accomplish such a feat, the Harris's Hawk engages in some amazing group hunting excursions where entire family groups work together to flush out prey. Taking turns, one bird chases after the target, then another, then another until the prey is simply too tired to run anymore. Or, sometimes a group will surround the hiding spot of its prey. One hawk will flush the prey out while the others are waiting, ready to pounce. Once the quarry is caught, the birds take turns feeding. This cooperative hunting helps more individuals survive, because it helps guarantee each bird a meal. 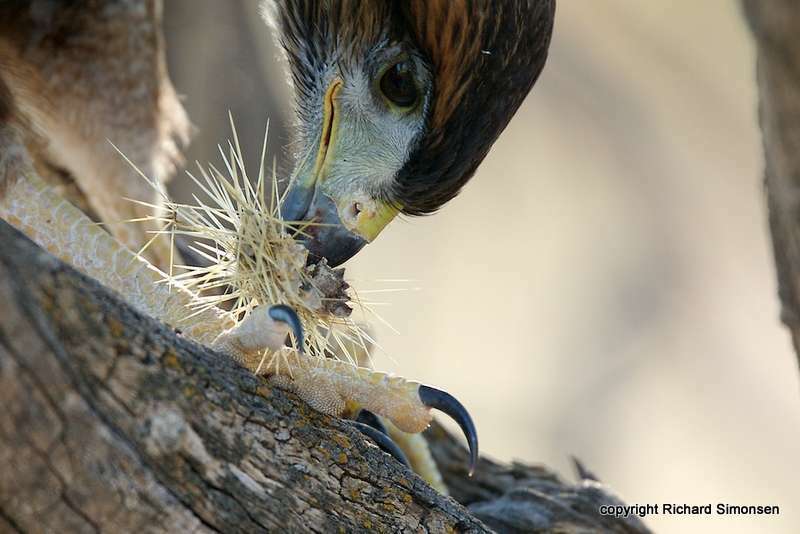 When not group hunting, Harris's Hawks feed mostly on small prey. They eat mammals, such as rats, but also take birds, such as pigeons, and snakes and lizards. They also feed on carrion – animals that are already dead. These interesting raptors may hunt from a perch or by flying along edges or through open vegetation, either pouncing on prey from flight or dashing in pursuit of birds similar to the way a Northern Goshawk might hunt. Though these birds are diurnal, they prefer to hunt very early or very late in the day. This makes sense, considering that they are often found in very hot areas. They prefer to hunt during the cooler parts of the day. Wouldn't you? As if Harris's Hawk families didn't do enough together, they also sometimes nest together. Though a single male and a single female can and often do raise their young together, some individual families engage in a behavior that scientists call "polyandry." This occurs when one female and usually two males work together to raise and care for their young. In the case of Harris's Hawks, perhaps five or six birds will all help to raise one pair's young. These extra birds are usually the young of the same pair that hatched in previous years. 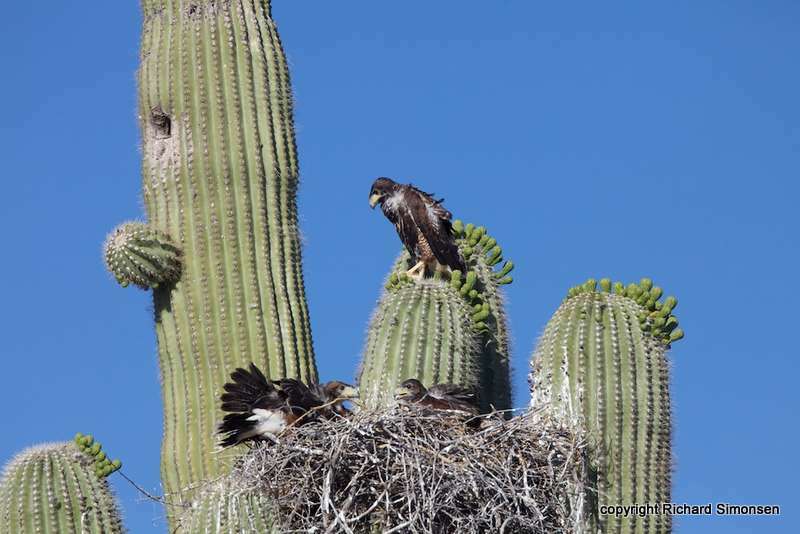 Whether nesting occurs by one pair or a family group, Harris's Hawks build compact stick nests in trees, bushes, cacti, and even on man-made structures. The female usually lays 2-4 white eggs, and she carries out the majority of the incubation duties, sitting on her eggs for 33-36 days. 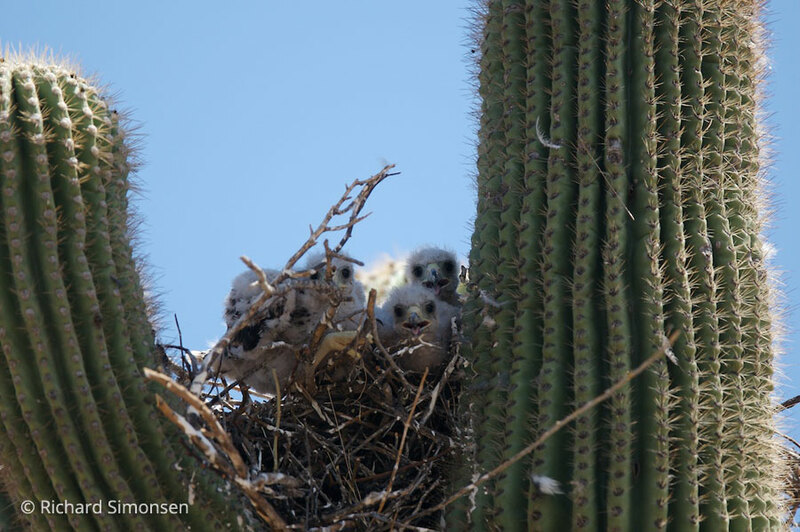 After the young hatch, they begin to grow quickly, but also need to be kept cool, especially those living in the extreme heat of the desert. The female sometimes spreads her wings over her brood to shade them from the hot sun. The young fly for the first time around 6 weeks after hatching, but they will stay close to the nest for 3-4 months or more before dispersing. Other individuals will hang around their parents' territory for years, participating in group hunting and helping to raise their future siblings. A vist to The Peregrine Fund's World Center for Birds of Prey is rewarded with close up views of many interesting and unique raptors. 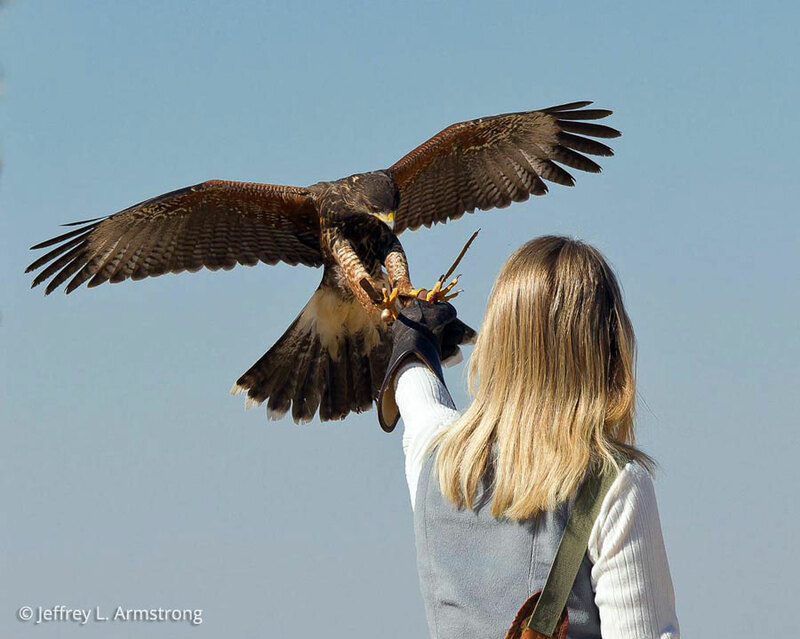 A Harris's Hawk is often one of the stars of our outdoor flight show. Each year in the fall, visitors are treated to the sight of watching this beautiful bird soar over the crowd, land on a nearby pillar, or alight softly onto his trainer's glove. The shows also give visitors a chance to learn more about the biology of the species.